Battalion Commander Tassar was the foremost architect of the Star Fortress program, employing her combination of scientific genius and strategic expertise in subjugating the larger portion of the Core Worlds for nearly half a decade. Of course, as our Alliance has proven, even the most brilliant designs can be compromised, and Tassar's esteem among the Zakuulan elite fell along with her battle stations. Tassar chose exile rather than face the direct judgment of her Eternal Empress, and was joined by her most loyal troops. A cult of personality formed around her, with her followers becoming increasingly zealous in their beliefs that Tassar was the one true hope for Zakuul's future. It's unclear if Tassar herself shared in this belief or merely exploited it to continue the work that had become her sole fixation: shoring up her Star Fortress designs to be completely indestructible. If her work had been completed, the integration of Rakatan self-repairing technology would have made Tassar's new Star Fortress truly formidable. Most of Tassar's data was destroyed, but our agents did discover one point of interest: Tassar's discovery of Rakata Prime and its technologies appears to have resulted from the interception of one of our own transports, which was carrying samples to Doctor Oggurobb for study. Investigation of that incident will be expanded immediately. - Anti-Alliance hatred fueled by manufactured propaganda. - Funding by several front companies originating in the Outer Rim. - Connections to various deceased persons of note. - Transmissions via a unique encrypted algorithm. - Presence and usage of rare cybernetic implants at each uprising site. This evidence directly connects the uprisings to a single conspirator. Their motives remain unknown, but they likely acted to destabilize galactic peace and weaken the Eternal Alliance. The scope and breadth of such a conspiracy speaks to an individual or group with substantial funding and expertise in the art of subterfuge and manipulation. 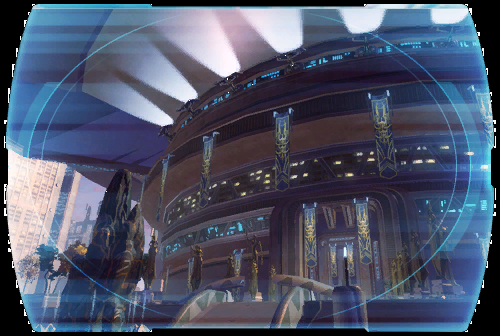 Alliance agents are currently investigating all possible perpetrators, including Sith Intelligence, the Republic SIS, and the Star Cabal. This conspirator cannot hide forever. With General Rike's forces defeated, the baradium mines of Denova are now under Alliance control; an odd twist of fate, given that we had no plans to claim the mines until Rike seized them to use against us. Although our forces can certainly make use of the explosive material, holding and defending the mines from here on will be an appreciable (if manageable) drain on Alliance resources overall. Rike had a history of exceeding orders in order to fulfill what he viewed as his duty to the Republic, so this action is hardly out of character. That he was able to move such a large force into position without challenge suggests strongly that there are further anti-Alliance conspirators within the Republic military; our agents are sifting through Rike's datafiles now to identify as many suspects as possible. Further details will be forwarded to you upon the conclusion of this investigation. Doctor Oggurobb's investigations are ongoing, but initial findings revealed that the Gethul entity contained genetic markers from dozens of species, including dianoga, rathtars, and surprisingly, Rakata. This is particularly interesting as certain particulate matter found deep within the entity's digestive tract is found only on the planet Belsavis, suggesting that the creature originated there and was at some point moved to Makeb, perhaps by the same Rakatans who constructed the Belsavis containment facilities. The entity's mental connection to Adelade and its sway over other biological creatures suggests some degree of Force sensitivity, further deepening the mystery of its origins and life cycle. Is this creature representative of an undiscovered species, or merely a unique creation of ancient Rakatan scientists? While we search for answers, one troubling mystery remains. Adelade found the entity based on intel she received from an unidentified third party. This source sent her precise coordinates--and the claim that she would discover one of the Force's greatest mysteries buried beneath Makeb. Who sent her this intel? If it was a friend, why cover their tracks? If an enemy, what did they hope to accomplish by luring Adelade into the heart of madness? We will continue to investigate. The RS-33 adrenal and its progenitor, the RAK-5 serum, have been contained and the research destroyed. Doctor Semhess's dangerous project is no longer a threat. Investigations into the project's origins and principal contributors are now underway. One notable early discovery relates to Doctor Rahser Poth, the expert who supposedly developed the RAK-5 serum. We've learned that his research was aided by an anonymous scientist. Their communications were encrypted, but we're piecing together what we've been able to recover--and it appears that this unknown scientist fed Doctor Poth the majority of the information that led to the RAK-5 breakthrough. Efforts to ID this scientist have turned up no results so far. Also of note is funding for the project, which was falsely obtained through a Republic endowment for disease research and treatment development. A staggering amount of data was altered to facilitate this, requiring slicing skills that no one among Semhess's staff seem to have possessed. Agents will continue analyzing the falsified data to find clues as to its origin and thus identify the additional conspirator(s). Investigations into the origins of Commander Kallin's plot are ongoing. After tracing the source of the explosives, we have ruled out that they were stolen from evidence lockups or purchased from any local criminal groups. Kallin's connections to former Chancellor Saresh are well documented, so it seems likely that he may have acquired the explosives through a mutual underworld contact. The slicing expertise necessary to gather so many combat droids is another point of concern. The methodology employed seems to match SIS techniques; these skills may have been acquired from another mutual contact with Saresh, though she was never particularly popular within that agency. Regardless, perhaps the most troubling aspect of the situation was its complexity and sophistication. Kallin has never been noted as a particularly surreptitious individual, preferring brute force tactics in most of his recorded operations. His psychological profile does not seem to match a false flag operation of this kind.